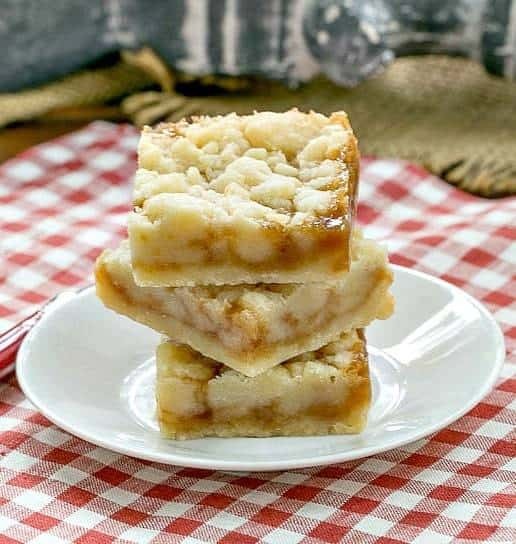 These crazy delicious Caramel Butter Bars are a heavenly treat that are a cinch to make! 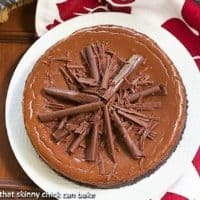 You MUST think up an excuse to bake up a batch! 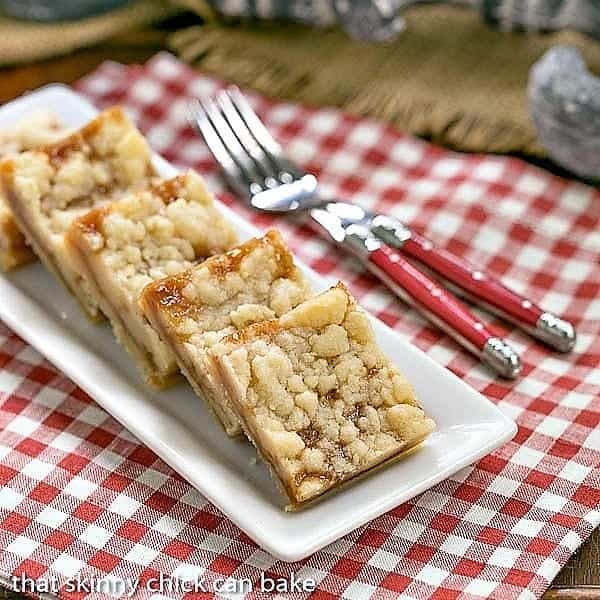 Layered with streusel and caramel over a shortbread crust, these buttery bars will thrill the caramel lovers in your life. And they may convert some who aren’t! I am a caramel purest, so I wasn’t sure what to think when a jar of Stonewall Kitchen’s Vanilla Chai Caramel Sauce arrived at my door. It tasted of subtle warm spices. Much like chai tea! I wondered how the flavor would come through baked in a butter streusel bar. Turns out these caramel butter bars were phenomenal. 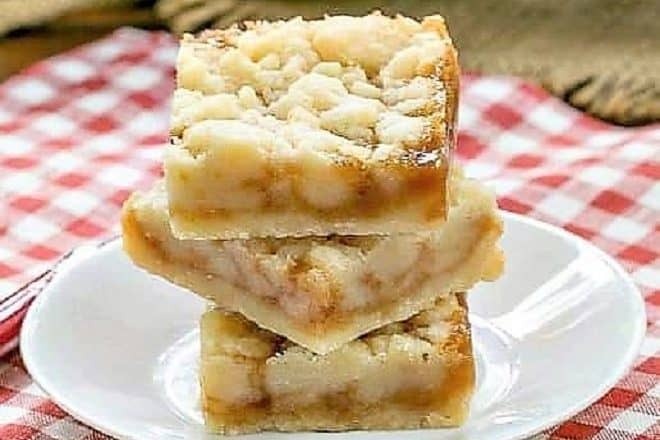 These caramel cookie bars are about the simplest dessert recipe you can make. If you love caramel, these caramel butter bars are a must make! The same dough is used to make the crust and to crumble over the caramel. Easy peasy. 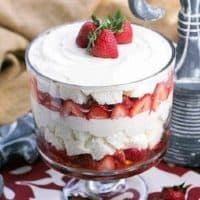 These gems can be made using just one bowl! If you really want to be precise, you can weigh out the dough so it can be accurately divided into one third for the crust and 2/3 for the topping, but I just estimated. And with a yummy jarred caramel sauce as the filling, there is no messing with a candy thermometer or unwrapping squares of premade caramels. You definitely don’t have to hunt down a specialty caramel sauce. But I do recommend using a premium brand for the best results. To find a premium brand of caramel, check the ingredients on the label for butter, cream, vanilla. You want real ingredients for the best caramel flavor! 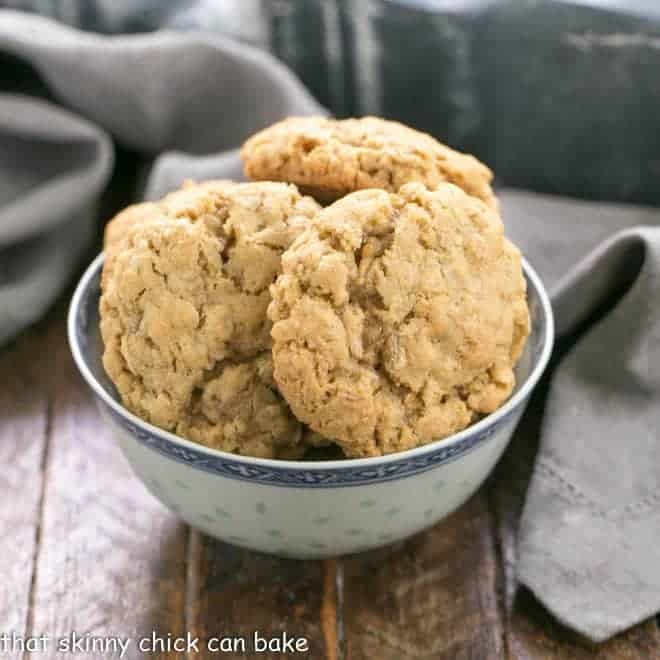 Since school is back in session, along with carpooling and sports, everyone needs a recipe that doesn’t take oodles of time or numerous ingredients to throw together. These will thrill any caramel fans in your family…heck, they will thrill anyone you know with a sweet tooth! 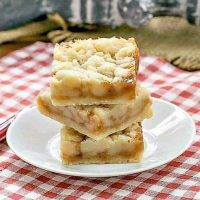 I’ve always had a soft spot when it comes to caramel desserts, whether it’s the Homemade Caramels I make for the holidays or Cookie Dough Billionaire Bars with a layer of gooey caramel. I’ve also made Chocolate Chip Caramel Butter Bars that are also outrageously delicious! I’ve had my eye on these luscious caramel desserts, too: Caramel Apple Magic Bars, Caramel Stuffed Chocolate Chip Skillet Cookie, and the World’s Best Caramel Brownies! 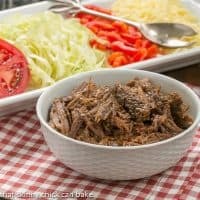 Simple flavors with delicious results! Perfect for caramel fans! In a large bowl, combine the butter and sugars. Using a hand mixer, beat butter and sugars till creamy. Add the vanilla and beat until combined. Add the flour into the butter mixture and mix on low till well combined. Line a 8 x 8-inch pan with non-stick foil (or regular foil, then spray with cooking spray).Press one-third of the dough evenly into the pan to form a bottom crust. Put the rest of the dough in the refrigerator while crust is baking. Bake crust until slightly golden, about 20 minutes. Drizzle the caramel sauce over crust and let sit for a few minutes before using an offset spatula to carefully spread over the surface. Crumble the reserved dough over the caramel. Return the pan to the oven and bake until the filling is bubbly and the crumbled shortbread topping is firm and lightly golden, about 25 minutes. Let cool before cutting into squares. Place in the refrigerator to speed up the cooling process if desired. If you love this recipe, you’ll want to check out my super easy Microwave Caramel Sauce. It’s been life changing! The recipe was adapted from my friend Lindsey of American Heritage Cooking. She made a salted caramel version. I tracked the original recipe to this cookbook. I’ll have to pass on this recipe. Not fond of caramel. I would totally use the caramel for a warm, gooey, caramel apple pie! The spiced caramel sounds perfect for the weather we are having here. Making these bars with this caramel in jar sounds like breeze. You mean besides eat it from the jar with a spoon? I think I’d have to drizzle it over a banana’s foster banana split. 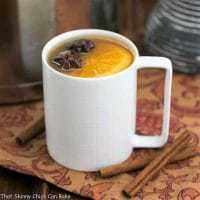 I absolutely adore the flavors of chai, and I can only imagine how awesome that caramel would be slathered onto a bagel! I’m sold on this one, Liz! Looks delicious! Love caramel, can’t wait to try that sauce! Omigosh! This sounds dangerous! I love caramel, too and would probably just spoon it over ice cream! LOL! That would be fabulous on Pancakes! I would use it in an apple pie! These look so good, and “easy” is key these days. Did I read that right that only 1/3 of the dough goes for the bottom crust and 2/3 for the top? It looks reversed in the pic, but that could just be my eyes. Thanks in advance for the clarification. I plan to make these soon (likely today)! I’m thinking I would try it over Blue Bell Homemade Vanilla ice cream. I’d try your recipe and try dipping some sliced apples in the caramel. Either in cookies or cake. 🙂 And your cookies look awesome! OK Liz you always know how to make me drool LOL I mean Vanilla Chai Caramel Sauce? Helloooooooooooo!! I’d eat it on some fresh picked apples…love this first taste of fall. Or swirled into some plain greek yogurt. YUM!! Well, on almost everything 🙂 Vanilla ice cream. Apple Pie. Drizzled over fruit crisp… Thank you for the chance to win! What a pity EU residents can’t enter. MMM I love caramel so much!! These look great! Wow, this looks like a dream dessert, carmel, a buttery crust and streusel. I love that it’s so simple with purchased caramel sauce. Your caramel bars look so enticing! Yum! 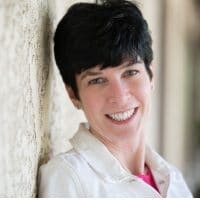 Would definitely have to try the Caramel Bars, the Cilantro Lime Aioli would be great to serve with Chicken Enchilada Bites and the Sweet Dill Relish would be a great addition to Crab or Shrimp Louie sauce. These bars look incredible! I will have to try them. I just love caramel anything! Oh my goodness Liz, these bars look heavenly! I love caramel but vanilla chai caramel sounds ridiculously amazing! I adore caramel, and these cookies ND the suace sound wonderful! I have a jar of this sauce in my fridge. I so know what I want to do with it next, these look amazing! 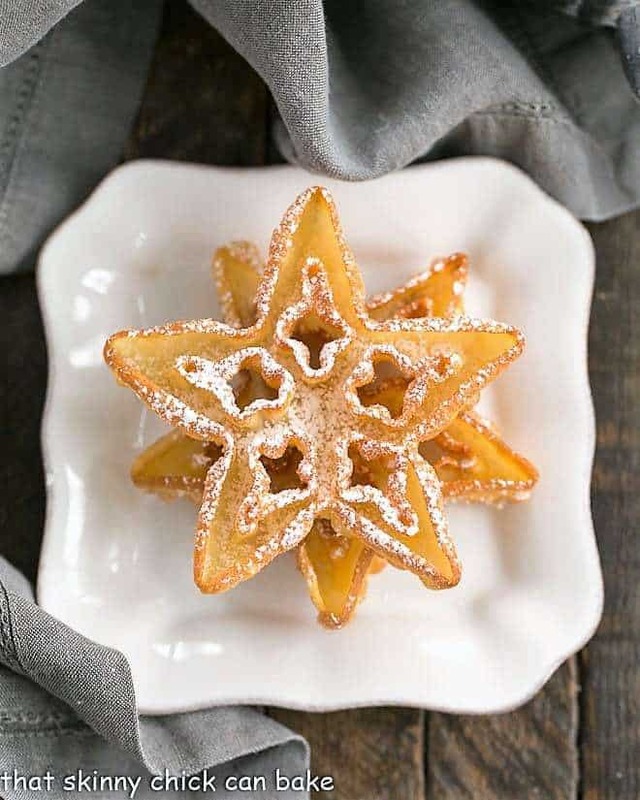 Mini-apple hand pies with a vanilla chai caramel drizzle sounds pretty delicious to me! Of course w/ ice cream. And it would make a pretty swirl on cupcakes. I would serve it warm on top of apple crisp. This looks so good…so delicious! 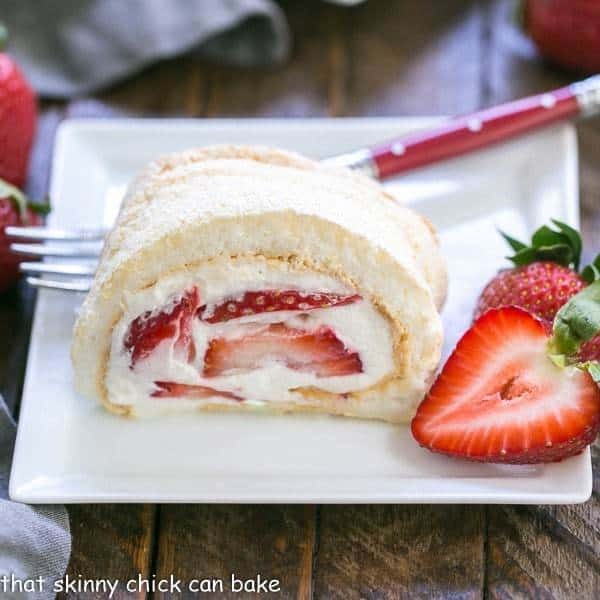 What a simple idea for something sweet…thanks for sharing! If I won, I think I’d do my best to replicate Ms Liz Berg’s delectable looking caramel butter bars! I’d pour it over homemade pumpkin ice cream! These bars look incredible and would be the first thing I made with that heavenly sauce! such a smart way to use that cool caramel sauce!!! These bars look so gooey and comforting and heavenly! Mmm.. That would be amazing all over vanilla ice cream! The bars look amazing! I LOVE this idea and just bought two jars of caramel from the store, so I am definitely adding this to my to-make list. Though I definitely wouldn’t mind giving that VANILLA CHAI CARAMEL SAUCE a try–it sounds so delectable! It sounds so good, I would probably eat the first serving with a spoon! Then I would try this recipe an if there’s any left, I would use it with roasted pecans on a bowl of ice cream! The most likely thing I would use this on is ice cream, but also drizzled on some chocolate cake or apple crisp. I would pour it over a giant bowl of vanilla ice cream and then dive in! I think it would be great over vanilla ice cream. On baked apples or apple pie! These Caramel Butter Bars sound great. I think they will work great in packed lunches. And so easy to make. Right up my alley! 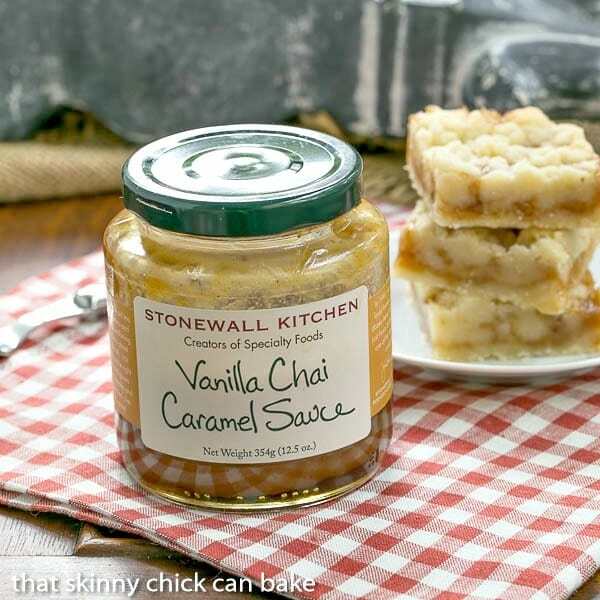 I think I would eat the Stonewall Kitchen Vanilla Chai Caramel Sauce right out of the jar! It would be great on brownies, too. I’m thinking caramel yeast rolls! Um… on a spoon? I think the caramel would make for pretty awesome brownies. I’d just make my normal brownies then drizzle caramel right on top so it bakes into the brownies! These sound amazing! Can’t wait to give them a try! I love caramel!! I am so interested in the Chai caramel! I would put it on vanilla ice cream. Maybe in brownies? Lovely bars, Liz! If I get lucky and win, I’d send this to my creative daughters to see what wonderful things they’d come up with. But point them first in the direction of your caramel butter bars! I would eat the Vanilla Chai Caramel Sauce with crisp apple slices. I would make this recipe -it looks amazing. And I wouldn’t mind licking the spoon after it’s been in that jar! Sounds wonderful.. and quick.. Would love to try it too. Being from Maine we love Stonewall Kitchen products. The stores are such a fun place to visit whenever I am in town. everyone here would swoon over these! They really are swoon-worthy! Thanks, Claudia! These bars are amazing! Delicious to the very last crumb. These bars taste heavenly! I will make these again and again! These are so good! A huge hit with my kids! You’ve got me at caramel girl. So yummy. My family was crazy about these! I seriously CRAVE these! Thanks for the awesome recipe!